Great place to stay at MG Road in Pune. Good location, quite clean and spacious room. Helpful staff went a long way to make sure I had comfortable stay. i have booked thos hotel for 6 days .three days there is no hot water and last day no water .... i stayed with my kid but difficult to stay there...they have charged much according to there standard .. Needs proper maintenance, and there was no breakfast even after paying for it. Lots of mosquitoes took away my night sleep. This hotel is located in the center of the city. It has clean and comfy rooms with common living & dining area for 3-4 rooms. 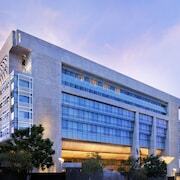 Located in HITEC City, this aparthotel is within 1 mi (2 km) of Mindspace IT Park and Cyber Towers. HITEX Exhibition Centre is 2.5 mi (4.1 km) away. Explained to hotel that my Expedia account was hacked and they told me it was my fault for not having my information secure. I will post negative posts on their website until my points are refunded back to me. They should have better procedures in checking identification.